souffle, originally uploaded by shaunaforce. Sometimes, I just cant believe the moments that arrive, the ones I slowly savor, followed by unexpected sweetness. You could never have told me that being diagnosed with celiac disease would bring such richness to my life. On Sunday, a puffed-high, light-brown perfection came out of my oven. Guided by the hands and expertise of a lovely new friend, this souffle made us both exclaim with delight. Gluten-free, flavored by gruyere and butternut squash, this was the first souffle Ive ever made. Well, really, Molly made it. I watched, fetched ingredients, and took pictures. And thanked the internet for bringing me more people. Molly writes one of the best food websites in the world: Orangette. For months, I had been slurping up her words, revelling in her stories, and wanting to meet her. Shes the wonderful woman who recommended those oven-roasted tomatoes I made in ample batches all summer long. She urged me to make a gluten-free version of her salt cod tart, after I left a comment on her site, drooling on the keyboard. And every time I read her site, ideas bloomed in my mind, ideas for exquisite dishes I could create to feed my friends. Afterwards, wed all raise our forks to the sky, in her honor. In the way that only urgent, personal writing can, her site made me feel like I knew her. I wanted to know more. Luckily, she had seen my site as well. She wrote me, and I wrote back. For days, we wrote feasting emails to each other, chatty and filled with food descriptions. We both adore writing and food, twin passions that feed each other. It wasnt long before we met, for cups of spicy chai, then a langorous walk through late-summer sunlight at the Ballard Market. She sampled from the bruschetta stand Ive been wanting to try for months, the one that compiles all the freshest foods from the local stands surrounding it, then creates tiny piles of gorgeous bites on crisp French bread. Obviously, its off my list, but I look at it longingly as I walk by it each week. Molly tried a sampler of three, including the octopus offering. As we sat on a little bench, bustling life walking by, the weakening light falling at our feet, she bit into one bruschetta and made a little moan. I knew in that moment that wed be friends. Weve been writing ever since. You can imagine the emails: voluminous, full of tastes weve been trying, stories galore. Im moved, all the time, by the people who have come into my life through this website. All of you who write-to thank me, to ask me questions, to tell me your stories-have become part of my life. My mind feels stuffed full of people these days. And my kitchen too. This time last year, when the car accident injuries rose up against me again, the trauma of the winter ahead of me, I felt carved out by pain, and fairly alone. This year, Im surrounded by people I never imagined existed, and Im continually meeting more. This world of food and words consistently amazes me. For weeks, Molly and I wanted to cook together. On Sunday, we finally did. We sent emails back and forth, considering choices, and deciding on a theme: butternut squash and pistachios. Why? Well, why not? Its autumn, definitively, and roasted butternut squash fills the kitchen with a haunting golden smell. And pistachios assert themselves, clearly, in a space where strong tastes can dominate. Besides, we both liked them both. Between the two of us, we could have come up with three hundred and twenty three recipes to cook. We needed a focus. And yes, if youre starting to salivate a bit now, you should be. It was just that damned good. Ill write about the other parts of the meal another time, because they deserve their own recipes. But for now, the souffle. Souffles always intimidated me. Deserving of patience, tasting of far-off places, and ready to deflate with the lightest knock on the door, souffles seemed like a show-stopping dish, the kind I could only make when I had gone to culinary school. Souffles felt like Paris: alluring and always calling, but tantalizing, on the other side of the world. Luckily, Molly has lived in the tantalizing city twice, and she is no longer intimidated. I make a mean souffle, she told me in an email, and I knew we had to do it. Because, on top of it all, souffles require flour. And if a confident souffle artist could create one with gluten-free flour, everyone else could follow. I dont know why everyone is intimidated by bechamel sauce, Molly said, as she stirred with focused attention. Butter, three tablespoons of Pamelas baking mix flour, and hot milk-all of it whirling in my black saucepan. The flecks of almond meal in the gluten-free flour turned the bechamel brown, but other than that, it came into existence easily. Maybe its the name, I quipped back. Its French. If we called it butter-flour-milk sauce, everyone would try. Whatever we call it, the sauce enticed us both into leaning our noses over the saucepan and whiffing in. Ahhh. 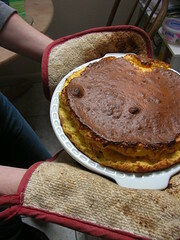 Within mere minutes, and several dollops of pureed butternut squash, Molly had built a souffle. My souffle dish is pint-sized, and Im sorely lacking ramekins. So we baked it in a deep-dish pie pan. No matter. We munched on the figs as we talked. (The pistachio torta cheese comes from Rollingstone Creamery in Idaho. A fortuitous, last-minute shopping trip at Metro Market revealed it to me, as they are doing a month-long celebration of American artisanal cheese.) The food processor stopped us for just a minute, with its rattling clatter as I ground the pistachios. But just for a minute. With food, blogs, writing, and boys for conversation, we could have gone on for hours. And then it emerged, gorgeous and ah-inspiring. Even Molly was impressed with its air-high shape, the golden brown top, the heavenly smell. It fell, almost immediately. Thats the way of souffles. We didnt care. We loaded our plates with spoonfuls of souffle, slivers of zucchini and leeks, and steaming slices of pistachio-encrusted fish. The weak sunlight streamed through the skylights as we lifted the forks to our mouths, bit into the souffle, and made little moans. Friends in food, we both smiled. Sunday lunch has rarely tasted this good. 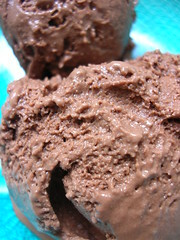 Id tell you about the chocolate gelato, but I should let Molly do it. After all, her boy bought her a gelato maker as a present, which is one of only many reasons she loves him. And thus, she should share that story. But that picture speaks for itself. It was too good for words to do it justice. What a lingering-in-the-mouth, love-in-the-making, dense-with-sweetness gift it was. What a gift it is to know Molly now. To linger over Sunday lunch and cook together. And know that well make something else spectacular together, soon. I cant imagine the people who are going to arrive in my life and fill my kitchen with their presence. Ive stopped trying. It all unfolds, in its own way. Here. Molly’s gluten-free adaptation of the cheese souffle recipe from The Way to Cook, by our dearly departed Julia Child. Butter a 2-quart souffle dish or large, deep-dish pie plate. Roll the grated Parmesan in the dish to cover the bottom and sides, shaking out any excess. Preheat the oven to 400 degrees Fahrenheit, and set the rack in the lower third of the oven. Place the butter and flour in a medium, heavy saucepan over moderate heat. Stir with a wooden spoon, and as the butter melts, the mixture will form a loose paste. Stir and cook until bubbling slightly, but do not allow it to color. Remove from the heat, let cool a few seconds, and then add the hot milk all at once, whisking vigorously to blend. Return the pan to the heat, stirring constantly with the whisk or a wooden spoon, and bring to a low simmer, about 3 minutes. 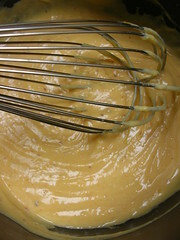 The mixture should thicken to the consistency of a homemade mayonnaise–i.e. fairly thick. Whisk in the paprika, nutmeg, salt, pepper, and squash, and remove the pan from the heat. One by one, whisk in the egg yolks. Set the pan aside. In a clean separate bowl, beat the egg whites to stiff peaks. Scoop a quarter of the whites on top of the cooked mixture, and stir them in with a spatula. Turn the rest of the egg whites into the top of the mixture, and fold it all together delicately but rapidly, alternating scoops of the spatula with sprinkles of the gruyere. Spoon and pour the finished batter into the prepared baking dish. Set the baking dish in the preheated oven, and turn the heat down to 375 degrees. 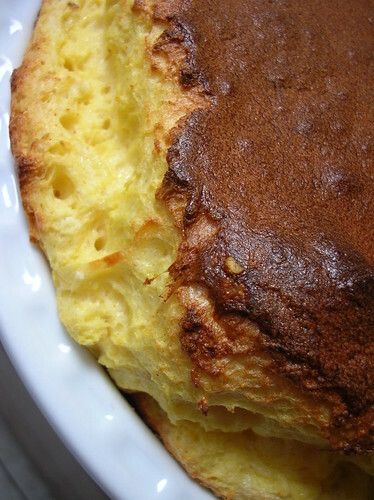 Bake 25-30 minutes, until the souffle has puffed and its top has browned nicely. Serve immediately. I ENVY you, what a wonderful way to spend a sunday, cooking with a friend!!! Please tell me more about the fish dish please, it sounds intriguing! Shauna, your description of this meal is almost criminally luscious! I love the image of you and Molly cooking and laughing and welcoming in the season together. And the meal… suffice it to say this souffle has shot straight to the top of my list (maybe dinner tonight?). Lovely post, lovely food – I wish I was planning a trip back to Seattle soon just so I could join you! I think it is so fun to meet fellow bloggers and it is an added bonus that you two share cooking in common. I have a butternute squash that’s been teasing me for the last week. I finally know what I will do with it and I even have all the ingredients. Now, what gluten free flour did you use? GFP Country French Bread/Pizza mix? Thanks! That’s so wonderful that you got to make a new friend through food-blogging! Catherine from Food Musings & I are planning to meet up next month. So cool! Community is where you build it and I’ve long said that people who diss the Internet because it’s somehow not “real life” are really missing the point. I love that I can form friendships with people, like you, who I’ve not yet met face-to-face. There’s a group of 150-200 Seattle-area (mostly) women that’s been hanging out togeter online for most of the last decade and we’re an incredibly tight group for mostly not being able to recognize each other’s faces. Having said that, I am still looking forward to actually meeting you next month on my next trip north. With any luck, I’ll be able to arrange enough time to come cook something with you! hi shauna, that looks spectacular…butternut squash, parmesan, gruyere and nutmeg…hmm, i couldn’t think of a more comforting combination really…btw, lovely blog you have here! After rolling down the screen painstakingly slowly (sometimes i just want to whip the little scroll bar up and down and yell, “Look at all this fabulous food writing i can read! RIGHT NOW! !”), and seeing your pictures of the puffy souffle, and that just-barely-melting-on-the-edges gelato, I nearly dropped the piece of toast i was eating. I leaned toward the screen, took a closer look, and fell of my chair moaning. Yes, this food blogging world is rather extraordinary. Please do tell me if you ever come to visit Seattle. And just for you, i’ll finish writing the post about the fish recipe! Oh, you were in the kitchen with us. In fact, as we were eating, I told Molly how jealous I am of her, because she had dinner with you and I didn’t! Please come back to Seattle soon. It is delightful to make these connection through food blogs. If you’re coming to Seattle, you have to let me know. But it sounds like you’re doing well there in Durham! We used the Pamela’s baking mix flour. It’s quickly becoming my favorite, because it has such a richness to it! Isn’t it fun to meet people like this? And you know you already share some sensibilities. I can’t wait to hear about your meetup. And when are you coming to Seattle for a visit? I know what you mean, my dear. I really do feel connected to the people whose words I read online. It’s an authentic connection. But I’m excited to meet you too. Let’s plan it soon! Oh, do try a souffle. You’ll feel so accomplished when you’ve made it. Certainly, it will give you joy. Thank you so much for your kind words. It means so much to me, because I adore your blog. Those photographs! Ach, you are so talented. And you always make me hungry. Thank you, again. And thank you for remembering to credit Melissa’s recipe. I had forgotten that! And I’m sure that Brandon enjoyed the last scoops as well. It was great. It’s wonderful to make these connections, like with you. Congratulations again on the baby arriving soon! I’m so glad I made you drop that toast, up there in Sitka. Toast? Bah! So much better to have souffle. When are you and your sister coming to visit me, by the way? Shauna, it’s so fun to read about friendships that start through blogging! Thank you for sharing such a lovely story. Coincidentally, I made a butternut squash soufflé, too! It’s amazing how similar our recipes are. I made individual ones that are unmolded and baked again when you’re ready to serve them. I used cake flour, which is low in gluten, so I’m not surprised that the gluten-free flour worked beautifully. This is exactly what the food world is about! What a wonderful tribute to friendship. Our neighborhoods grow closer day by day. And literally sometimes too! Molly did a perfect rendition of Melissa’s recipe and you phtographed it so well! Great recipe! I’m finally able to make the rounds and visit all the wonderful souffles everyone made for IMBB 20. What a pleasant and delightful day and recipe you’ve shared with us! I’ve always found cooking much more inspiring and satisfying when I’m cooking for (or with) friends. Wow, soufflees are my specialty, but I never would have dared either to “de-glutenize” or to substitute a pie pan for the standard dish. I think the fragility of the souffle is a bit of a myth created by French chefs to scare us oafish Americans off their turf. Congratulations on piercing the veil of souffle mysticism! thanks for the easy bechamel recipe! i’m playing with an idea: spaghetti squash in a white sauce with ground lamb and tomato chunks. my husband is gluten-free so i was trying to figure out how to pull it off. thanks for the recipe. on to the kitchen (if its a disaster there’s a gluten-free pizza in the freezer)!